Say Nothing, Act Casual: The driving force. Today was long. But it had a good ending. We got here, and it's beautiful. 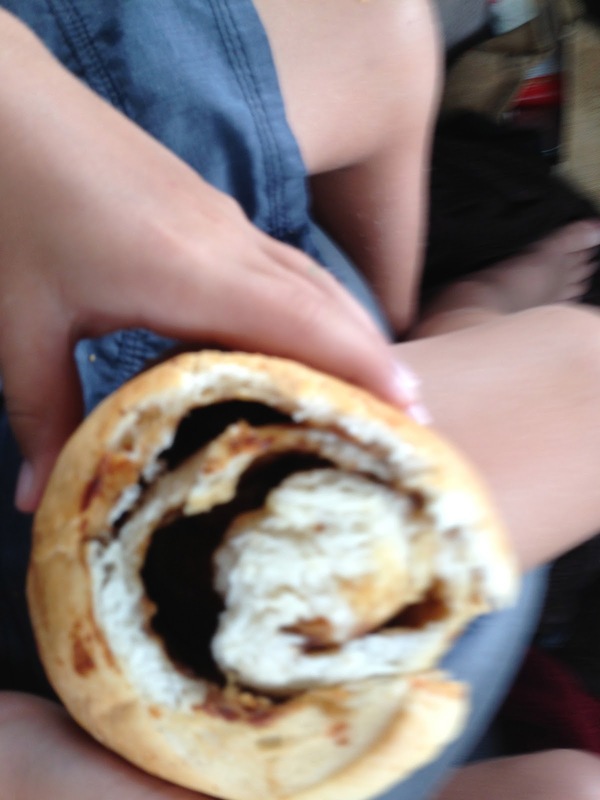 Josh started the day with a vegemite scroll, which was, in his words, as big as his face. We drove and drove, and eventually reached the countryside. Issy shouted out 'SHEEP!". But actually it was cows. Josh got a sore neck. I was worried for a a half second until I realised how many hours he'd spent bent over his ipod. I thought Mike's bike was about to fall off the bike rack. I stopped to check. It was fine. And it stayed on. Stephen Fry talked us through the last 5 chapters of Harry Potter and the Prisoner of Azkaban. Someone decided today was a good day to transport a house from Holbrook (just north of Albury) to somewhere south of Albury (which is the same way we were going). The submarine at Holbrook. With added Christensen goodness. Luckily they pulled over periodically to allow the enormous build up of traffic to get past. A house I tell you. An entire house. It was MASSIVE. Took up both lanes. Entirely. And Easter Eggs, and Twisties. And Coke Zero. Don't forget, anything eaten in a car on a road trip is non calorific. It's just a fact of life. The DVD player started playing up, so we let Stephen Fry talk to us some more. This time about the Goblet of Fire. We arrived to find our accommodation neat and tidy, with a delightful ambience. We walked to pizza. Which was delicious. The kids sussed each other out. They found each other most satisfactory. I caught up with people I love. It was grand.